The Revel wall sconce light by Tech Lighting captures light in motion. The sleek metal surface is laser-cut with horizontal slots which allow light to shine through the inner white diffuser. Optional wood end caps complement the design with a touch of warmth in an unexpected way. A bottom glass diffuser provides a glare free wash of light onto surfaces below. 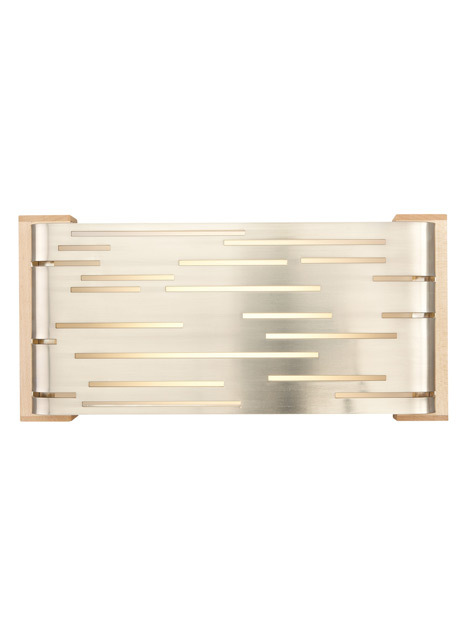 This motion inspired sconce scales at 3.7“ in width and 12.7” in length making it a great solution for bathroom lighting, hallway lighting and bedroom lighting flanking two end tables. For even further design freedom the Revel sconce can be mounted vertically or horizontally. Also included in the Revel family are three other complementary fixtures, Revel linear wall, Revel pendant and Revel linear suspension, simply search Revel wall to find its closest relatives. Your choice of fully dimmable integrated LED lamping ships with the Revel suspension saving you both time and money. The sleek metal surface is laser-cut with several horizontal slots which allows light to shine through the inner white acrylic diffuser. The diffuser wraps around the inner top and bottom to conceal the hardware and lamping when viewed from any angle - above and below or if mounted vertically, both sides. included wood end caps complement the design with a touch of warmth in an unexpected way. May be mounted horizontally or vertically. Includes two 13 watt 2GX7 base twin tube compact fluorescent lamps or one 8 watt, 400 lumen, 2700K LED module. LED version dimmable with low-voltage electronic dimmer. ADA compliant.